The MOSSAR Color Guard Team participated at the Westport DAR Chapter 75th Birthday Celebration, on Monday, June 18, 2012, which was held at Linda Hall Library located at theUniversity of Missouri, in Kansas City, MO. Westport DAR Chapter Regent Peggy Evans and approximately 60-65 ladies attended the Westport DAR Chapter 75th Birthday Celebration. Attending were Donna Nash, State Regent, Marry Lynn Tolle, Honorary State Regent and Past Vice President General, NSDAR, and other District and state officers and chapter regents. They also recognized past chapter regents and 50 year members, including one member with 65 years of service. 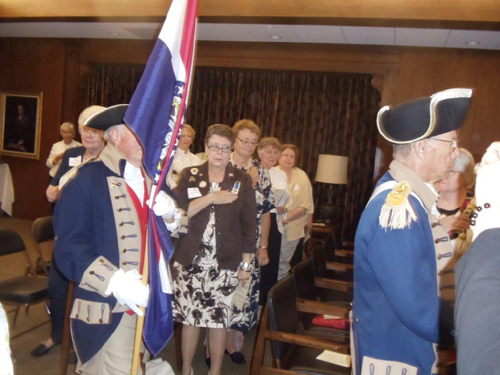 The Westport DAR Chapter was the third DAR Chapter that originated in the Kansas City area. Left Photo (R-L): Compatriot Al Paris and Robert L. Grover, MOSSAR Color Guard Commander. 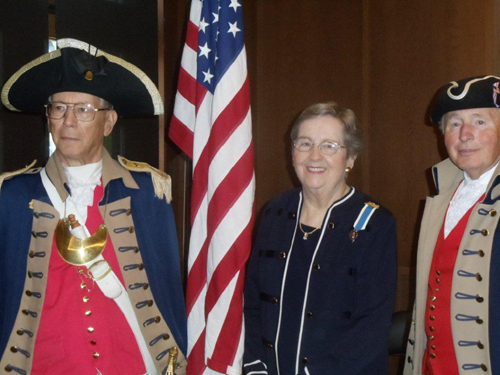 Right Photo (R-L): Robert L. Grover, MOSSAR Color Guard Commander, Westport DAR Chapter Regent Peggy Evans, and Compatriot Al Paris.